Smolen JS, et al. Ann Rheum Dis. 2017;0:1-18.
the Proceed button will take you to an external site. Deliver increased bioavailability—Higher, more consistent, and more predictable than oral MTX at every dose.1,2 Review data. Deliver disease control—Even at the same dosage, subcutaneous MTX provides better disease control than oral MTX.3 Review data. Deliver tolerability—Gastrointestinal side effects are generally less intense with scMTX vs oral MTX.4 Review data. If your RA patients are experiencing an inadequate response to oral MTX, maybe it's time to consider scMTX. 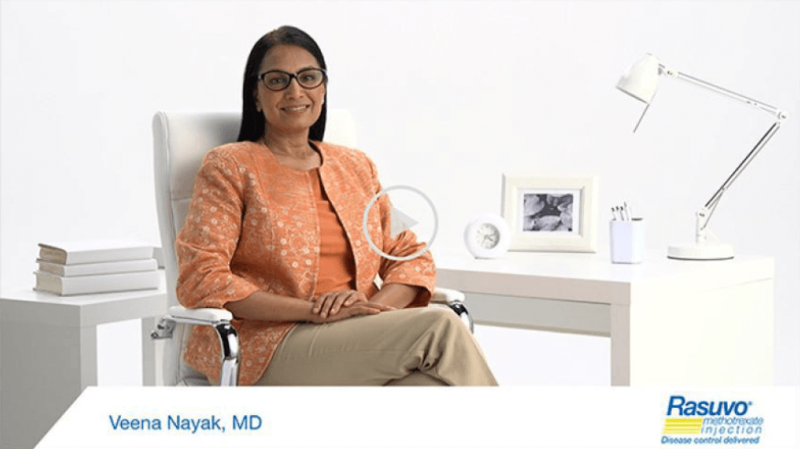 Watch as Dr. Veena Nayak discusses how she identifies an inadequate response to oral MTX in her patients and some of the benefits of switching to an scMTX option, like Rasuvo. References: 1. Pichlmeier U, et al. Clin Exp Rheumatol. 2014;32:563-571. 2. Braun J. Ther Adv Musculoskel Dis. 2011;3:151-158. 3. Braun J, et al. Arthritis Rheum. 2008;58:73-81. 4. Kromann CB, et al. J Dermatol Treat. 2015;26(2):188-190. Management of adults with severe, active rheumatoid arthritis (RA) (ACR criteria) or children with active polyarticular juvenile idiopathic arthritis (pJIA), who are intolerant of or had an inadequate response to first-line therapy, including full dose non-steroidal anti-inflammatory agents (NSAIDs). Symptomatic control of severe, recalcitrant, disabling psoriasis in adults who are not adequately responsive to other forms of therapy, but only when the diagnosis has been established, as by biopsy and/or after dermatologic consultation. It is important to ensure that a psoriasis "flare" is not due to an undiagnosed concomitant disease affecting immune response. Rasuvo is not indicated for treatment of neoplastic diseases. Rasuvo should be used only by physicians whose knowledge and experience include the use of antimetabolite therapy. Because of the possibility of serious toxic reactions (which can be fatal), Rasuvo should be used only in patients with psoriasis or rheumatoid arthritis with severe, recalcitrant, disabling disease which is not adequately responsive to other forms of therapy. Deaths have been reported with the use of methotrexate in the treatment of malignancy, psoriasis, and rheumatoid arthritis. Patients should be closely monitored for bone marrow, liver, lung, skin, and kidney toxicities. Patients should be informed by their physician of the risks involved and be under a physician's care throughout therapy. Methotrexate has been reported to cause fetal death and/or congenital anomalies. Therefore, Rasuvo is not recommended for females of childbearing potential unless there is clear medical evidence that the benefits can be expected to outweigh the considered risks. Rasuvo is contraindicated in pregnant women. Methotrexate elimination is reduced in patients with impaired renal functions, ascites, or pleural effusions. Such patients require especially careful monitoring for toxicity, and require dose reduction or, in some cases, discontinuation of Rasuvo administration. Diarrhea and ulcerative stomatitis require interruption of therapy: otherwise, hemorrhagic enteritis and death from intestinal perforation may occur. Malignant lymphomas, which may regress following withdrawal of methotrexate, may occur in patients receiving low-dose methotrexate and, thus, may not require cytotoxic treatment. Discontinue Rasuvo first and, if the lymphoma does not regress, appropriate treatment should be instituted. Like other cytotoxic drugs, methotrexate may induce "tumor lysis syndrome" in patients with rapidly growing tumors. Potentially fatal opportunistic infections, especially Pneumocystis jiroveci pneumonia, may occur with methotrexate therapy. Pregnancy: Rasuvo can cause fetal death or teratogenic effects when administered to a pregnant woman. Rasuvo is contraindicated in pregnant women. If this drug is used during pregnancy, or if the patient becomes pregnant while taking this drug, the patient should be apprised of the potential hazard to the fetus. Nursing Mothers: Because of the potential for serious adverse reactions from methotrexate in breast fed infants, Rasuvo is contraindicated in nursing mothers. Alcoholism or Liver Disease: Patients with alcoholism, alcoholic liver disease or other chronic liver disease. Immunodeficiency Syndromes: Patients who have overt or laboratory evidence of immunodeficiency syndromes. Preexisting Blood Dyscrasias: Patients who have preexisting blood dyscrasias, such as bone marrow hypoplasia, leukopenia, thrombocytopenia, or significant anemia. Hypersensitivity: Patients with a known hypersensitivity to methotrexate. Severe hypersensitivity reactions have been observed with methotrexate use. Organ System Toxicity: Rasuvo has the potential for serious toxicity. Rasuvo should be used only by physicians whose knowledge and experience include antimetabolite therapy. Because of the possibility of severe toxic reactions (which can be fatal), Rasuvo should be used only in patients with psoriasis or rheumatoid arthritis with severe, recalcitrant, disabling disease which is not adequately responsive to other forms of therapy. Embryo-Fetal Toxicity: Methotrexate has been reported to cause fetal death and/or congenital anomalies. Rasuvo is not recommended for females of childbearing potential unless there is clear medical evidence that the benefits can be expected to outweigh the considered risks. Rasuvo is contraindicated in pregnant women with psoriasis or rheumatoid arthritis. Exclude pregnancy before treatment. Females should be counseled on the serious risks to the fetus should they become pregnant while undergoing treatment. Avoid pregnancy if either partner is receiving Rasuvo. Advise males to avoid pregnancy for a minimum of three months after therapy and females to avoid pregnancy for at least one ovulatory cycle after therapy. Effects on Reproduction: Methotrexate has been reported to cause impairment of fertility, oligospermia and menstrual dysfunction in humans, during and for a short period after cessation of therapy. Laboratory Tests: Patients undergoing Rasuvo therapy should be closely monitored so that toxic effects are detected promptly. Baseline assessment should include a complete blood count with differential and platelet counts, hepatic enzymes, renal function tests and a chest X-ray. Risks from Improper Dosing: The physician and/or pharmacist should emphasize to the patient that Rasuvo is administered once weekly and mistaken daily use has led to fatal toxicity. Patients with Impaired Renal Function, Ascites, or Pleural Effusions: Elimination is reduced. Such patients require especially careful monitoring for toxicity and require dose reduction or, in some cases, discontinuation of Rasuvo administration. Dizziness and Fatigue: May impair ability to drive or operate machinery. Malignant Lymphomas: Non-Hodgkin's lymphoma and other tumors have been reported in patients receiving low-dose oral methotrexate. However, there have been instances of malignant lymphoma arising during treatment with low-dose methotrexate, which have regressed completely following withdrawal of methotrexate, without requiring active anti-lymphoma treatment. Discontinue Rasuvo first and, if the lymphoma does not regress, appropriate treatment should be instituted. Tumor Lysis Syndrome: Like other cytotoxic drugs, methotrexate may induce "tumor lysis syndrome" in patients with rapidly growing tumors. Concomitant Radiation Therapy: Methotrexate given concomitantly with radiotherapy may increase the risk of soft tissue necrosis and osteonecrosis. Common adverse reactions are: nausea, abdominal pain, dyspepsia, stomatitis/mouth sores, rash, nasopharyngitis, diarrhea, liver function test abnormalities, vomiting, headache, bronchitis, thrombocytopenia, alopecia, leukopenia, pancytopenia, dizziness, photosensitivity, and "burning of skin lesions". The most frequently reported adverse reactions include ulcerative stomatitis, leukopenia, nausea, and abdominal distress. Other frequently reported adverse reactions are malaise, undue fatigue, chills and fever, dizziness and decreased resistance to infection. Aspirin, NSAIDs, and Steroids: Concomitant use may elevate and prolong serum methotrexate levels, resulting in deaths from severe hematologic and gastrointestinal toxicity. Proton Pump Inhibitors (PPIs): Concomitant use of some PPIs may elevate and prolong serum levels of methotrexate and cause increased toxicity. Oral Antibiotics: Certain oral antibiotics may decrease intestinal absorption of methotrexate or interfere with enterohepatic circulation by inhibiting bowel flora and suppressing metabolism of the drug by bacteria. Use of Rasuvo with penicillins should be carefully monitored. Hepatotoxins: Patients receiving concomitant therapy with Rasuvo and other potential hepatotoxins should be closely monitored for possible increased risk of hepatotoxicity. Theophylline: Methotrexate may decrease the clearance of theophylline, therefore theophylline levels should be monitored. Folic Acid and Antifolates: Vitamin preparations containing folic acid or its derivatives may decrease responses to systemically administered methotrexate. Folate deficiency states may increase methotrexate toxicity. Mercaptopurine: Methotrexate increases the plasma levels of mercaptopurine, therefore dose adjustment may be required. Other Drugs: Toxicity may be increased because of displacement of certain drugs. Use of Rasuvo with probenecid should be carefully monitored. Pregnancy: Methotrexate has been reported to cause embryotoxicity, fetal death, congenital anomalies, and abortion in humans and is contraindicated in pregnant women. for a minimum of 3 months after treatment with Rasuvo for males. during and for at least 1 menstrual cycle after treatment with Rasuvo for females. Pediatric Use: Safety and efficacy of Rasuvo have not been established in pediatric patients with psoriasis or neoplastic disease. Geriatric Use: Use caution in dose selection. Elderly patients should be closely monitored for early signs of hepatic, bone marrow and renal toxicity. Renal Impairment: Elimination is reduced. Patients require careful monitoring for toxicity and require dose reduction or discontinuation of Rasuvo. Hepatic Impairment: Contraindicated in patients with alcoholic liver disease or other chronic liver disease. Rasuvo is for once weekly subcutaneous use only. Administer Rasuvo in the abdomen or thigh. For adverse events, medical inquiries and product related concerns, please call 1‑855‑33MEDAC (1‑855‑336‑3322). © 2017 Medac Pharma, Inc. All rights reserved. MP-RA-0463 September 2017 Rasuvo is a registered trademark of Medac Pharma, Inc.